The 1894c with Buffalo Bore for Hogs WARNING GRAPHIC PHOTO!! Thread: The 1894c with Buffalo Bore for Hogs WARNING GRAPHIC PHOTO!! This topic has been brought up many times here about the ability of 1894c concerning hog hunting. 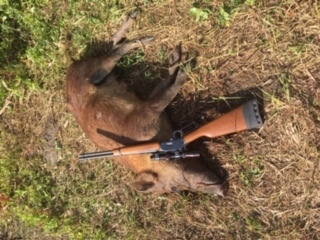 So I purchased some 125 grain jacketed HP Buffalo Bore to test in my Marlin 1894c for accuracy and for its ability to kill hogs cleanly. 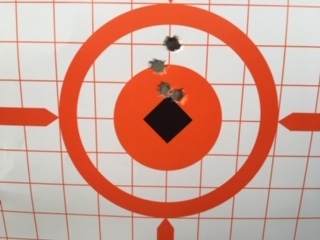 The target picture was fired from 100 yards off sandbags the first two shots were very tight the second two moved a little the were fired fairly fast without letting the barrel cool as a hunting situation could be. The accuracy was more than enough for hunting purposes. Buffalo states the muzzle velocity for the round out of the rifle is 2298 feet per second with 851.3 foot pounds of energy @ 100 yards. 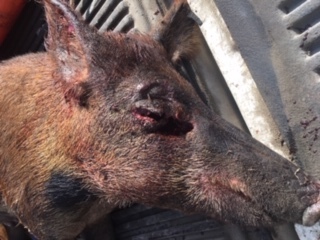 I shot two hogs with the round the first was a shoulder shot on an estimated 100 pound boar the hog dropped cleanly there wasn't an exit wound. The second hog (pictured) was shot at about 50 yards and dropped instantly, this hog is estimated to be 125 pounds. I was surprised to see that the entrance wound was so large. What I found is the rifle with this round is more than enough to take hogs with from 100 yards in. The foot pounds of energy starts dropping off after that so longer shots would probably need to be head and neck only. 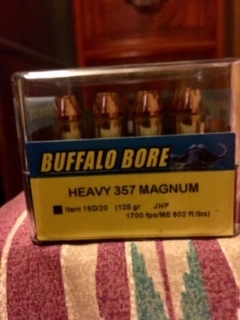 Buffalo Bore has 158 grain JHP also that may work at longer ranges. M1Riflenut, edcknives, gunscrewguy and 34 others like this. Nothing wrong with that and good job. palmetto pirate, Judson and no primers like this. Favorite caliber- How is that even possible? good shooting. yep! that left a mark! ouch!!! palmetto pirate, Judson and deerhog like this. That's the worst entry wound I've seen no matter the caliber. The bones in the head are fairly hard and maybe it was the angle. The little rifle is handy in the truck and does the job within its range. alawrence, mrguvna and no primers like this. What was the graphic part of the photos? palmetto pirate, Judson, redhawk0 and 2 others like this. The Flag my father Earned so we could all see it wave. That's great shooting. Did you get chance to examine the bullets? I guess this sort of contradicts the "125 grain .357 bullet blowing up when shot from a carbine" statements you read. I use a warm hand load with Hornady 158 grain XTP hollow points in my .357 rifles. I have read that these will blow up in deer when shot from a rifle. I have shot a number of deer and have always had "pass throughs" and so have never recovered a bullet. 94win30wcf, Judson, Da Duke and 2 others like this. The hogs are on a sugarcane farm and the meat is excellent. I gifted the hogs to people that could use the meat and with temps here in the 80's I got it to them quickly so no chance of spoilage. The next one I take I plan on keeping myself and if possible will collect the bullet. I have no doubt that the rifle with this ammo would dispatch a deer quickly. edcknives, maki00, white cloud and 2 others like this. Hey Pirate - good report and thanks for the pics. That .357 rifle dun ya good I'd say. palmetto pirate and M700 like this. Bring a couple of 5 gallon buckets of brine or have them immediately ready when you get home. Soak 'em overnight. Then take them to a local smokehouse if there is one than get bacon, ham and Canadian bacon it up. I would grind the rest and either make your own or bring it in as well and have it made into sausage, salami and kielbasa, etc.. Used to a lot myself but anymore been outsourcing all the processing to local guys that are setup for it. Thanks for the range report & the hog hunt story. It's nice to hear about the 1894C on a hunt. 32rimfire, palmetto pirate and M700 like this.